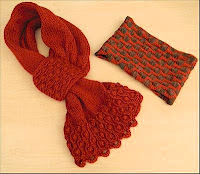 Knit Up & Dye Podcast, Yarn & Knitting Patterns: Learning, Adapting and Improving! The month of "ME" is quickly coming to a close, and oddly, I'm grateful. I have completed a couple of projects, but still have one on the needles that I might yet be able to finish during this dedicated period. For the most part, I'm happy with the end results of these projects, but I learned a lot along the way. I learned that patterns, even by published professionals, have flaws. Big, nasty, unprofessional, frustrating flaws that I worked hard to convert into learning experiences. Warning: Rant like material follows. Now I'm not just talking about errors. Typo's, calculation errors, and general editing errors happen and they happen to EVERYONE no matter how long you've been designing, how many times you've been published or how perfect your pattern/design is. It's Murphy's Law. I accept it. I'm talking about flaws in follow through and customer service. When I purchase a pattern, I expect errata, and I look for it. I don't expect that errata from YEARS earlier won't be corrected on the freshly uploaded PDF, but rather located on an obscure out of date website, different from the site you actually purchased from. When I purchase a pattern, I expect that there may be techniques I am either not familiar with or termed differently than I'm used to. I don't expect to find a two-line URL full of symbols and mixed case characters (that cannot be copied and pasted) directing me to a 30 second wordless video (presumably filmed at night in a closet) on the Internet. When I'm finally able to find a way to contact a designer to report errata, I don't expect to be told I'm in the wrong, only to receive an email shortly after saying that the errors have been found BY THE DESIGNER and corrected, thank you. What did I gain from all this - rant subsiding? I learned to research patterns and designers before making a purchase to be sure I could find proper errata and means to contact the designer. Does this mean I won't purchase a pattern unless I can do this? No, of course not. I've never found a pattern I couldn't gleen some good out of, and not all designers are still among the living, and therefore, not available to chat. I can, however, extend my research circle to other buyers (Ravelry is WONDERFUL!) who have completed the pattern/project and posted notes which may or may not include corrections. I was reminded that EVERY contact is an opportunity to provide EXCELLENT customer service. Never tell someone they are wrong, then take their hard won edits and publish as your own - they will NEVER buy from you again. I learned that nothing is more appreciated than a pattern with clear, concise language that has been tested for accuracy and checked for typos - twice or more, with clear explainations of uncommon techniques. I learned that there is great value in setting aside dedicated time to stop designing and get hands on experience with new techniques, new contacts and the works of other designers. I've updated my website to offer more information about my products, services and ways to contact me. I've streamlined my website's ordering process and am now using Ravelry's shopping cart, in addition to my Ravelry and Etsy stores. I will be starting a group on Ravelry so that anyone purchasing any of my patterns will have yet one more way to connect with me and other's who have knitted my designs. I'll be reviewing my published patterns for ways to improve or clarify instructions, and work to provide better instructions in the future. I will continue to place value in each and every customer and begin a follow-up system in which I will be checking in with my customers to see if they have questions and to offer support. 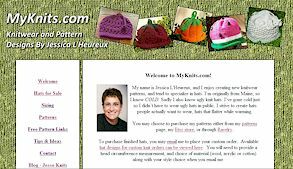 I will be adding more pages and information to my website as a reference tool for all knitters, with emphasis on techniques I employ in my designs.